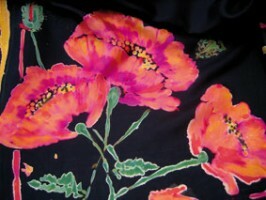 The technique of discharging removes colour from the fabric, but does not necesaarily take it back to white - it depends what dyes were used to begin with. To add colour at the same time mix iron-fix paints such as Dye-na-flow in with the DeColourant, to remove and add colour at the same time. Decolourants will only work on dyes such as Procion, Acid or Steam-fix silk dyes, not on heat-set paints.